Use this instructional animation video to learn how to plant a tree. Planting trees is simple and fun. Use the tree planting detail image and the video to guide you. Read on to learn more details about planting trees like when to plant, where to plant, watering systems and hardiness zones. Sun – Does the tree need full sun or part sun? Shade – Does the tree need mostly shade, often called an understory tree (i.e., under the canopy of larger trees)? Dry or Wet – Does the soil drain well, does it dry up quickly, does it become boggy? Wind – Is the area an open windy space? Irrigation – Does it rain regularly or is there access to water? Go Native – Native trees are wild, originating in the local natural environment. Introduced trees are those brought from another location. Naturalized trees are introduced trees that have adapted to the environment and grow wild and spread. Look at the natural environment around you. Choose trees that are native to your climate. Local and state university environmental departments, government parks departments, local nurseries or arborists can help you identify native trees. Identify the micro climate of your area. Find out what trees would do best in your local environment. Read on to find information on native trees and the resources to help you identify trees that would best fit your area. In winter you can plant as long as the ground is not frozen or snow covered. In summer you can plant when it is not too dry and hot, generally below 75 degrees fahrenheit (24 degrees celsius). You can plant when it is warmer, if you are able to water the tree regularly, weekly. Fall is the ideal time to plant trees. The weather is cooler and the trees are going dormant. The tree will not be as stressed moving from one home to another. Planting in the fall allows time for the tree to establish its root system and gradually adapt and grow in its new home. Spring is a good time to plant, but be mindful of the warming weather and the need to water newly planted trees. It is best to water with a slow drip system. This way the water will reach deeper into the ground helping the roots to stay deep in the ground. With shallow surface watering (as with a sprinkler or hand held hose) the roots will seek the water closer to the surface and therefore destabilize the tree's root system. You can use tree gator bags or a gallon plastic milk jug with the lid on and a small hole poked through the bottom and top of the jug. 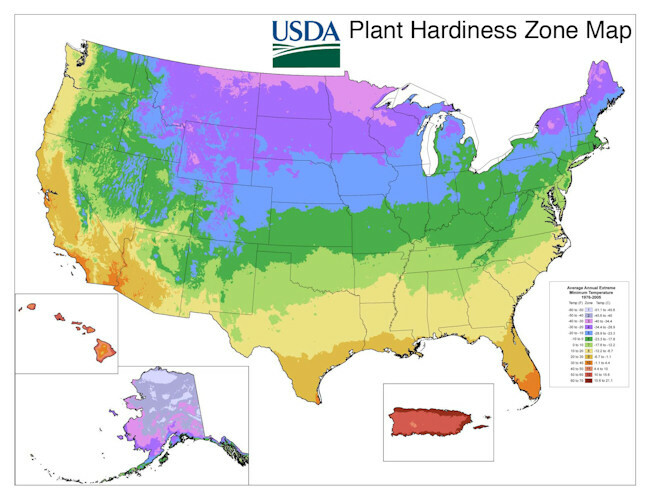 These hardiness zone maps are color coded to provide guidelines on how well trees will grow in a designated location.